SuperCeramica is a ceramic based material combined with glass. Its credentials are as long as your arm and include: oil resistant; acid/chemical resistant; scratch proof; heat proof; fire resistant; non-toxic; eco friendly; recyclable. What’s not to like? 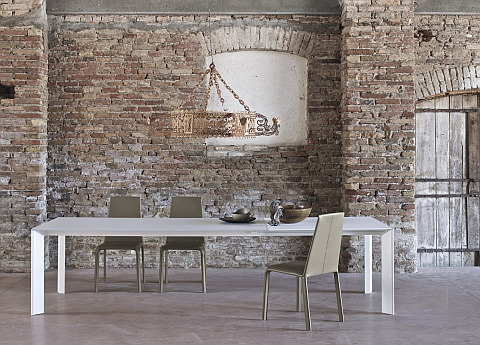 Shown above, the Cruz dining table (in ‘sand’ SuperCeramica) is also a versatile table, available in five different sizes, with the small version one of our smallest extending tables at just 120cm long x 80cm wide, and the largest version 102cm wide and 290cm long when extended. We love it so much we’ve now got one in our Kings Road showroom – which many of our clients’ children regularly put through its paces. It’s always won! The Dublino table is also offered in SuperCeramica (seen above in anthracite SuperCeramica) along with melamine, matt lacquered wood and velvet anti-scratch glass, while the strong metal frame can be lacquered in a range of colours or in chrome. 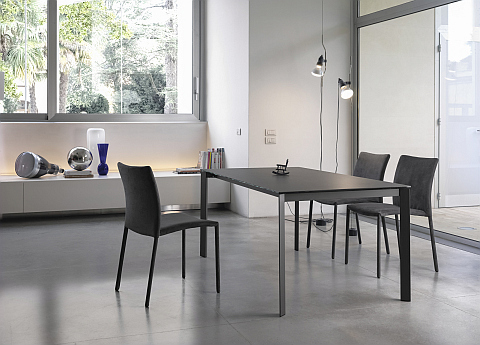 The Genio table (above) is seen here in anti-scratch white glass. Again, superb credentials: abrasion resistant; stain resistant; non-absorbent (liquids slide away); easy to clean (important with glass); warm to the touch; wide choice of colours. Three different extending sizes to choose from. So, sit back and enjoy your table, your family and friends, the meal. No more fretting about burn marks, water stains, scratches… just let the science be with you! Previous PostPrevious Paying Tribù to the great outdoors!